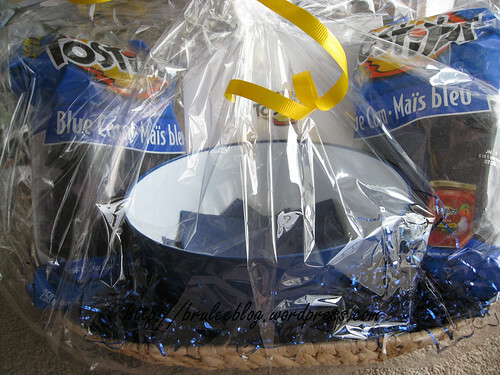 I have a lovely Tostitos gift basket to give away to one lucky person! To win two bags of blue corn Tostitos and a giant bowl to put your munchies in, simply reply to this post and tell me your favourite way to eat tortilla chips. If you prefer, you can e-mail me privately instead of posting here. One entry per person, and you must be prepared to pick up the basket somewhere in the Edmonton area. Edited to add: Whoops forgot to say when this contest ends! Deadline is end of day July 25,2010. I like to eat them with mild or medium salsa. I am a frequent fan of many Tostitos varieties (the original restaurant style, gold, multigrain, and scoops are ideal for my cheesy artichoke crab dip), but one of my favourite ways to enjoy Tostitos is at my annual Pumpkin Carving Party. I toss them into a old-fashioned coffin-shaped dish made out of black cardstock that’s lined with wax paper, make some homemade guacamole, and a corn & blackbean salsa for dipping. Eating ‘Crypt Chips’, ‘Ghoul Goo’ and ‘Sinister Salsa’ just makes the evening that much more fun! Tostitos is a monster hit! Will I still have a valid chance if I say’ with no shirt on, over the kitchen sink, so as to catch all the crumbs.. If Sarah is ok with you eating your chips that way, then I’m ok with you using it for your contest entry. …with squashed avocados, sour cream and hot salsa. Simple is best. Baked with some cheese, bacon, and sour cream on the side. Yum.. getting hungry thinking about it. I honestly eat tortilla’s mostly in nacho’s-it’s one of Kyle and mine’s rare foods we get to eat when the kids go to bed. LOL at Chris’ comment. I like to eat mine with guacamole or ooey gooey melted cheese. Thanks for the opportunity Ms. Brulee :-D. I hope you don’t mind that I linked this giveaway on my giveaways page. I eat mine with tasty homemade guacamole! Yum! With homemade guacamole or topped with peppers, tomatoes, mushrooms, and mozzarella and broiled. Yum! Straight. Or with melted cheese. Its a good salty snack fix. Did you write a post about our lovely fear factor food night? I still have the pictures of the duck fetus sticking out of Drew’s mouth! But of course! Didn’t you see the photo in the banner at the top of the page? Also, https://bruleeblog.wordpress.com/2010/02/06/balut-and-a-blogiversary/.